First of all, why is topical exfoliation with a gentle sugar scrub so important to your detox ritual from the outside in? It prepares your skin to more optimally absorb your moisturizing treatments. Moisturizer that sits on top of dead skin cells destined to flake off is not able to properly do its job. Why spend your time and money on fabulous products that can’t do their best work because of the way they are applied? Never apply your favorite moisturizer to old surface skin cells when it’s so easy to apply it on fresh new skin for maximum radiance and smoothness. It’s a skincare no-brainer! 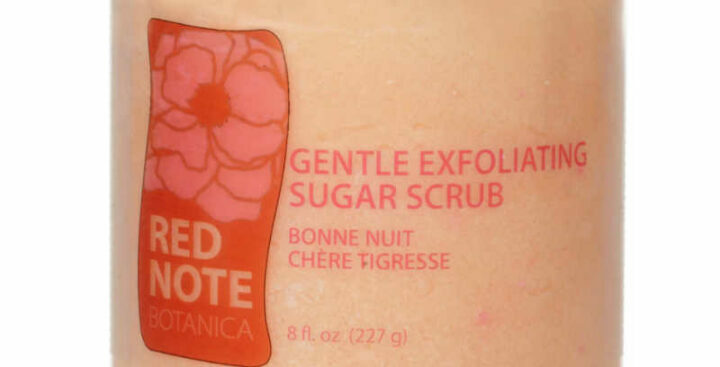 What makes Red Note’s Gentle Exfoliating Sugar Scrub so unique? You mean besides the lusciously soft and super smooth supple way it makes your skin feel and look? Your skin is your largest organ. It absorbs all topically applied product ingredients. Oils and butters rich in antioxidants, nutrients and vitamins help to heal and keep your skin looking and feeling its best. These butters are solid at room temp. 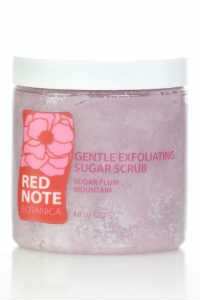 Your sugar scrub is firm but will melt easily on your warm wet skin. It will never be oily, drippy, or gloppy-gloopy and plop into your tub or shower. We’ve all had that happen, and it was important to me to formulate a sugar scrub that didn’t do this! Your scrub is solid, but soft, mushy, malleable with the warmth of your hands. Natural oils and butters moisturize your freshly exfoliated skin like nobody’s business! So, after you gently massage in your sugar scrub, leave it on for just a few min. Allow the natural oils and butters to penetrate your skin before washing it clean. Sugar will rinse completely clean from your skin. You’ll immediately feel and see the difference in your skin! And with regular use, you’ll fall in love with your skin all over again! Indulge, explore, play and discover your favorite fragrances form our 20 beautiful fragrance lines! Twice a week in tub or shower. You don’t gain any extra benefits from over-doing it. A very gentle twice weekly all over exfoliation with a sugar scrub in a base of nutrient rich oils and butters that melt on contact is ideal. The key word is gentle. Your skin is not hard wood furniture or sandpaper. Gentle massaging motions will be safe, effective, and will achieve best results without irritation. Hard to reach spots? Grab a friend. Sorry, there are just some spots we can’t reach! Apply our rich thick lotion, whipped souffle creme, and/or uber-rich body butter, that’s like, well, butter. 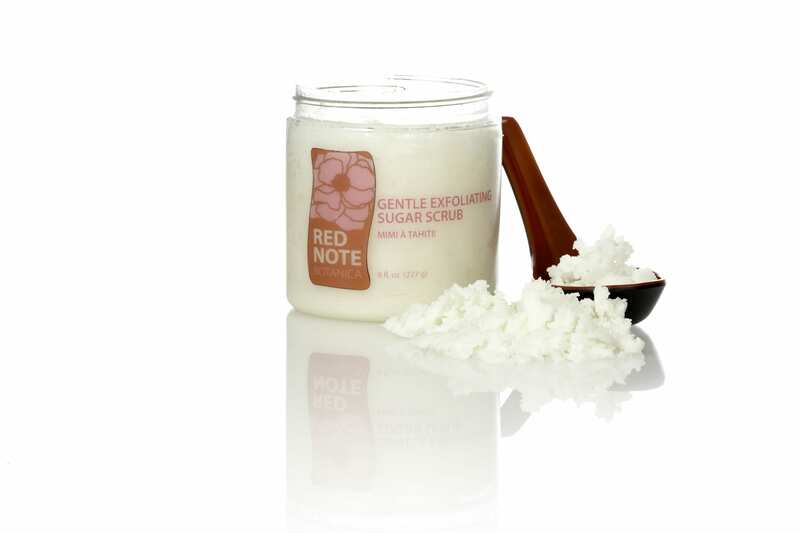 You’ll naturally ramp up the power of your moisturizing treatments when you exfoliate first. Why? With autumn’s drier air, your moisturizing lotions, cremes and body butters will more easily penetrate and soften your skin when you’ve prepared its surface by gentle exfoliation. Immediate results are always exciting, but with regular exfoliation, we promise you’ll notice LONG TERM BENEFITS – gorgeous radiant youthful skin to look at and touch. That’s what really makes us keep on making our Gentle Exfoliating Sugar Scrub for you! Fresh, radiant, soft and healthy skin today and tomorrow. Exfoliate now to get rid of the old and prepare for the new. Why wait for your best skin ever?